Organizers have begun a fundraiser to pay for bronze sculpture. A plan is in the works to commemorate Concrete High School graduate Douglas W. Vose III (class of 1988) with a lifesize bronze statue installed on the school’s campus in July. Vose’s younger brother, Jason (CHS ’91) is coordinating with Concrete School District and Town of Concrete to plan the dedication ceremony, which is tentatively scheduled for Sat., July 27. The statue will match Doug Vose’s height at 5 feet 10 inches and include a brick and concrete foundation designed by Lynn Scheinman, a member of Vose’s military team. A fundraising effort has begun to raise the $40,000 needed to build the statue; donors may go to www.gofundme.com/1sqyh8 to learn more and make a donation. Organizers hope to raise the necessary funds by March 14. Major Jason Vose, a U.S. Marine Corps operations officer with the 3rd Reconnaissance Battalion, currently stationed at Camp Schwab, Okinawa, Japan, also is working to arrange additional events to be held in conjunction with the dedication ceremony, including freefall jumps onto the Mears Field property in Concrete by Special Operations team members, the Force Reconaissance detachment, and Green Beret Special Forces. 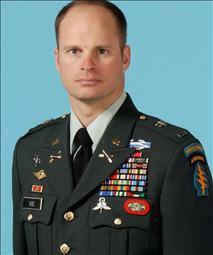 A Chief Warrant Officer 2, Douglas Vose died from wounds received July 29, 2009, while conducting combat operations in the Kabul Province of Afghanistan. He was serving at the time as the Special Forces Assistant Detachment Commander with Operational Detachment Alpha – 0114, Alpha Company, 1st Battalion, 10th Special Forces Group (Airborne), in Stuttgart, Germany. Vose was 38 at the time of his death. He was killed by intense, direct, small-arms fire while deployed to Afghanistan in support of Operation Enduring Freedom as a member of the International Security Assistance Forces (ISAF) – Afghanistan. Vose’s awards and commendations were numerous. His awards include the Bronze Star Medal, the Purple Heart, the Meritorious Service Medal, the Army Commendation Medal, the Army Achievement Medal, the Army Good Conduct Medal, and the Humanitarian Service Medal. He received a third Bronze Star with Combat V and two oak leaf clusters in lieu of third award for his actions on the day he was killed. The denotion of “Combat V” to his third bronze star was awarded for his display of tremendous valor under fire in combat, with great risk to his own life. He received a silver oak leaf cluster upon his Army commendation in lieu of 6th award and the silver oak leaf cluster and bronze oak leaf cluster in lieu of 7th award upon his army achievement medal. 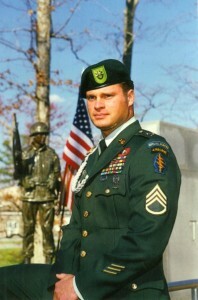 His decorations include the National Defense Service Medal, South West Asia Service Medal, Kosovo Campaign Medal, Afghanistan Campaign Medal, Iraqi Campaign Medal, Global War on Terrorism Service Medal, Armed Forces Service Medal, Non-Commissioned Officers Professional Development Ribbon, Army Service Ribbon, Overseas Ribbon, NATO Medal, Kuwait Liberation Medal (Saudi Arabia), and the Kuwait Liberation Medal (Kuwait). Vose also earned the Airborne Badge, Combat Infantryman’s Badge, Parachutist Badge, Military Free Fall Parachutist Badge, and the Special Forces Tab.